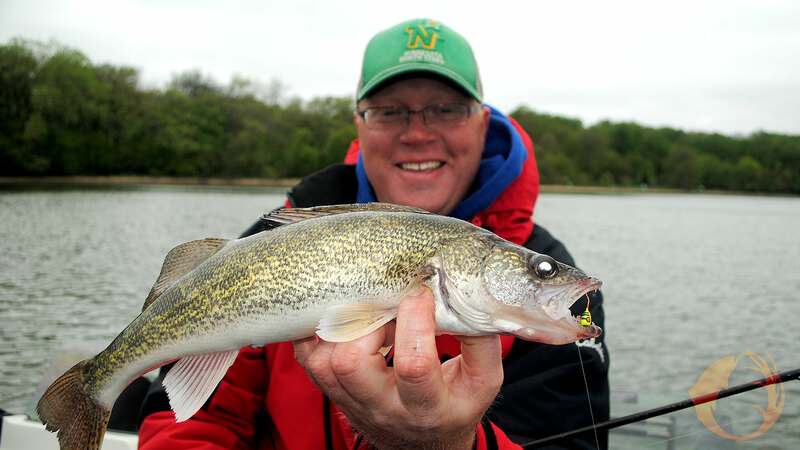 Walleyes can be caught using a lot of different bait types, and most walleye anglers take most of those bait types with them when they go fishing. But in the early part of the season, you’re probably going to do okay if you just take your jig box, and in many places you’ll only need sixteenth and eighth ounce jigs. Not everywhere, but in many places. Walleyes are getting ready to spawn. They’ll look for areas with a sand or rubble bottom. In lakes, they’ll seek out light current areas. In rivers, they’ll want to be in areas where the current isn’t too strong. The author’s spring walleye jig box. The Lure Lock box with its sticky surface keeps the jigs easy to see and prevents spilling. Feature Photo: Here’s our fishing friend Bill Bunn with a jig-caught spring walleye from Clear Lake in north central Iowa. Clear Lake is an outstanding early season walleye lake. To see new and old episodes of Fishing the Midwest television, new and old fishing articles, and fishing video tips, visit fishingthemidwest.comand don’t forget to join us at Facebook.com/fishingthemidwest.